Today Opera released a new “stable” build to the public. The latest “stable” version of Opera changed from Opera 9.27 to Opera 9.50. Opera released Opera 9.5 Release Candidate 1 (RC1) just two days ago. Between Opera 9.27 and Opera 9.50, the Opera Desktop Team fixed ~2350 bugs! You can view the changelogs for Windows, Macinstosh and Unix. Please help spread Opera! digg it! This is an incredible amount of fixes for a browser or any product! For a full overview of the new features in Opera 9.5 check out my overview of Opera 9.5 Release Candidate 1 (RC1) Opera 9.5 is available for Windows, Macintosh and Unix x86 (32-bit) and Unix x86_64 (64-bit). 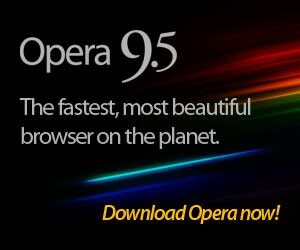 Go get Opera 9.5 now! The new version of Opera no longer is displaying the Netflix site properly. Under the “Friends and Faves” section is the ability to view images in a “rotating queue” of your movie selections. Worked fine in Opera 9.27. Images don’t display at all in 9.50. I’m sure this happens in other sites as well.